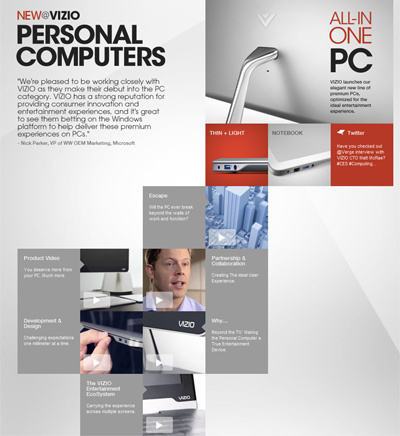 Asked by agency Wong Doody Crandall Wiener to create a showcase video announcing Vizio’s entry into the personal computer market at the 2012 CES show in Las Vegas, the sleek line of notebooks and a stunningly simple All-In-One were brought out of the den and into the living room. 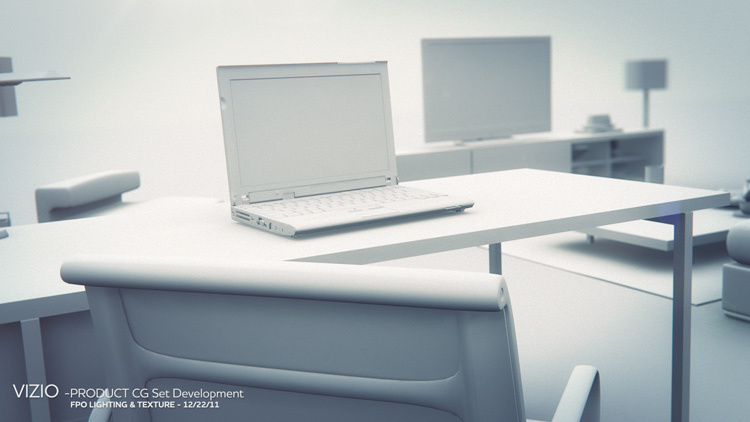 As for a real-world video shoot, but entirely in the computer, we designed a room both stylish and functional, with placement of all elements considered for the camera moves needed to track with the VO. When a company makes a bold move into new territory, a story needs to be told. To maintain viewer interest before the product reveal, the individual furnishings were animated, twirling as they rose up out of the void, expressing a new place for the computer to be at home – in the main room of the home. Contemporary product design continues to reach levels unanticipated just years before. We’re fortunate to get to work with some of the coolest new products and devices designed by extraordinary talents local and abroad. These products are beautiful in form, even without textures. The necessary trick of the script was to get from the TV to the computer, and then to the contemporary replacement of both of them. Designing the room for the need, Luke found a way to align the elements, move the virtual camera and cut to the reveal of the All-In-One that is visually seamless and on the beat. The creative process of environmental design is a collaborative effort with all interested parties invited. The Related Grey team creates concise .pdf files to show options in all things. Refining of the desktop tones and textures is shown on the left, reflections of another surface on the right. The Ultrabook is looking elegant with a tick of cyan/blue and product correct finish. The final video, output at 60fps for visual acuity, was shown on 72” monitors throughout the CES venue. The closing frame mnemonic developed of their logo was selected for use across all videos. If you just heard the crack of a bat, that was what we at rG consider a home run.